Just purchased Quickbooks® for the PC or Mac and need help setting it up? Have you been using Quickbooks® for years and need your file cleaned up? Don’t understand what a balance sheet or profit and loss statement is? I can help. Purchasing Quickbooks is only the beginning. Your file must be set up properly in order for you to use it effectively and in order to provide useful management and financial reports for you and your CPA or Tax Preparer. Additionally, there are many aspects to setting up and running your own business and my diverse experience can provide you with an excellent resource. Stacy not only handles all of her client's accounting needs, she also makes my job much easier by getting me what I need for the tax returns. I know that when I am working on one of Stacy's clients, I will get timely and accurate information. The work that Stacy did with me and my staff brought us to a new level of functionality. She is extremely knowledgeable and professional. She is an excellent teacher who fosters independence and understanding of process -- not just rote maneuvers. It is a comfort to know she continues to be there if we need her. Stacy has been a lifesaver for my company. She was able to very quickly and efficiently make some sense of the chaos caused by my previous bookkeepers. She is the very best in the business! Before I worked with Stacy, my Quickbooks® was a serious mess, I had little understanding of my business tax requirements, and my financial picture as a whole was blurry at best. Since consulting with Stacy, my Quickbooks® is in order and immaculate, and she has helped my financial picture come into focus using clear language, very different than what you get talking to your CPA. Her help has been invaluable to my business. Stacy's solid organizational skills have helped us achieve great successes with many of our events such as Run for the Seals and the SF Giants' Marine Mammal Day and that has helped us reach out to a vast audience of new members, donors and volunteers. 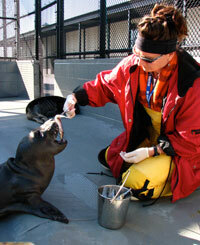 "In addition, she is a solid leader and mentor among her colleagues on animal care crews.